“From the heart.” “From the gut.” These are the clichés of artistic diminishment. Our culture struggles against conservative atavism; the notions that there is no forward momentum in creative enterprises. The great works are made; the great artists have died. The smallness of the assumption that a creative project should endeavor solely to the end of “emotional resonance” reflects not only the outdated philosophy of musty out-of-the-way Universities, but the positioning of art as a trite, impoverished substitute for experience. It’s often the case that a show is too easily ascribed to purely emotive intentions, and it would be a disservice to Leemour Pelli’s current show at Annina Nosei not to acknowledge the archness in her choice of titles “From the Heart,” or the deep ambivalence and political distrust inherent in her apparently romantic tableaus. The medium size oil paintings depict, for the most part, hazy, repeated images of couples embraced—embraced perhaps in the midst of a Waltz, or in the midst of love. With such titles as “Time for Love,” “First Love,” Pelli teases at the pleasing Hollywood agendas. But Pelli, whose renderings, as well as her use of repetition, demonstrate her fully conscious of film, realizes these romances with a well-articulated sense of dread. There is no individuation to any of Pelli’s figures, and their waltz, over and over again, is a direct address of the expectations of formulaic love, and the resulting failure that such expectations bring about. 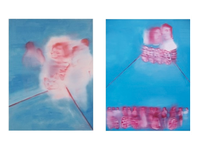 Pelli’s tie-in to present-day politics is equally chilling; the show, in hues of red, white and blue, brings to mind not only the model of family as perpetrated upon populations by religious minorities, but all the models of family that are excluded by the narrowly construed. Whether it is a question of equal rights for women in Saudi Arabia, or gay marriage in America, Pelli recognizes the fairytale romance as emblematic of our devolutionary tendencies. Spooky and unapologetically hopeless, Pelli’s Cupid is armed by Haliburtan.